UPPER EAST SIDE — Co-op and townhouse owners on a "pristine" block of East 69th Street have banded together, forming a new block association and hiring lawyers to help them fight the MTA’s plans to build new subway entrances for the 6 train on their corners. The transit authority is eyeing two new entrances on the block as part of a $57 million plan to add an elevator to the 68th Street/Hunter College station and to help ease overcrowding. The Upper East Side stop is the 30th busiest station in the system and the second busiest local station, officials said. But residents on the tony block, many of which came to a Community Board 8 meeting Wednesday night, are worried the entrances would ruin their quiet residential enclave. “Sixty-ninth Street is a really bucolic street,” said Charles Salfeld, a resident of the Imperial House at the southwest corner of East 69th Street and Lexington Avenue. “But [by] putting this subway entrance in front of our building, you turn 69th Street into 68th Street, which is a busy commercial street." MTA officials told residents it planned to add an elevator at the southeast corner of East 68th Street and Lexington Avenue, where a tiny flower shop now sits. However, to build that elevator, the authority said it would have to close the entire station down for a year, or build new entrances on another block for a multi-phase project that would take about three years. “The idea of spending $57 million because you want to put in an elevator, and that elevator is going to change the character of our buildings, is madness," Salfeld said. Lois Tendler, of the MTA’s government affairs division, said new entrances were necessary. "There is no way that building the elevator could happen without closing the station," she said. 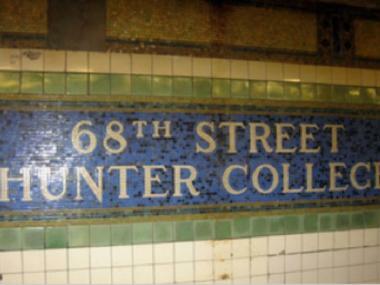 The MTA has selected the 68th Street/Hunter College station as one of its 100 "key stations" where improvements to comply with the Americans with Disabilities Act will be implemented by 2020 to meet federal requirements. Officials also said the station was too crowded. The Second Avenue Subway would cut down on 58 percent of the morning commuters coming to 68th Street, but only 17 percent of morning commuters leaving it, according to transit officials. "There is a problem that exists at that station and we are trying to solve it," Tendler said. "It’s not like somebody decided, let’s make the people on 69th street miserable for the next few years." Gordon Johnson, the MTA's corporate counsel, told residents the agency will be conducting an “environmental assessment," analyzing pedestrian movement and the impact on the area’s character and historic district. The north side of East 69th Street is landmarked and has a row of eight carriage houses, including one at 157 E. 69th St. where the late famous painter Mark Rothko had his studio. Still, residents are teaming up — and hiring legal muscle — to stop the project. “The co-ops on 69th Street have gotten together and formed a block association and retained counsel,” resident Bill Roskin said, with his lawyer from Davidoff Malito & Hutcher sitting next to him. Roskin told MTA officials that owners on the “pristine” block were hopeful to have a discussion about changing the entrances. “But it seems like you are so locked in on 69th Street,” he said. Transit officials said it would be more complicated and expensive to build the entrances on East 67th or 70th streets, and that they have already spent a lot of time looking at alternative scenarios and narrowing them down to the most feasible ones. Few locals seemed to care about alleviating the crush of straphangers coming on or off the platforms. The MTA expects to complete its environmental assessment by June. A public hearing and comment period would follow, officials said.